*”Gain the Power of the Acupuncture Master by using HealthPoint™, the most effective and accurate electronic acupuncture device found anywhere with 10’s of thousand of devoted users around the world. Brand New Unit that is more robust and easy to use and is now shipped with Instruction DVD, 160 Condition Treatment Manual, a Gold Probe, plus a Cotton Bud Probe for the Eyes and Auricular Clips to treat the ear points to help with stress and sleep problems. HealthPoint™ also gives you, ‘The Power Of Acupuncture – without Needles. 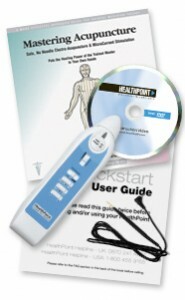 HealthPoint Kit is supplied complete with 160 Condition Treatment Manual, HealthPoint Treatment Device, Training DVD, Remote Gold Treatment Probe, Cotton Bud Probe, Auricual Clips, Quickstart Guide, Vinyl Case. ‘HealthPoint’ is the foolproof way to precisely locate acupuncture points – putting the accuracy of trained masters in your own hands’. What does the Healthpoint do? HealthPoint, with the aid of the advanced location system, help you to accurately locate acupuncture Points. Of all traditional healing methods, acupuncture is the most widely accepted in the West – with 2,000 years of history and significant recent compelling evidence that its theories are wonderfully effective. Stimulation of acupoints – either with needles, massage or electro-pulses – is now a common treatment for a variety of painful conditions. There are many published maps of the body’s acupuncture points (by far the best guide is ‘Simply a Safer Way’) – but actually locating those exact points on the body is, in practical terms, very difficult. Even experienced masters are only about 90% accurate in finding a precise acupoint needed to treat a given condition. But all that has changed – with ‘HealthPoint’, designed with Dr Julian Kenyon M.D. – founder of the British Medical Acupuncture Society. ‘HealthPoint’ is a compact, battery-powered, hand-held device with a built-in detector that senses the low electrical resistance of an acupuncture point. When the tip is within 0.5 mm of an acupoint, the visual and audio indicators confirm that you’ve found the point… with an accuracy that surpasses even the highly trained. Then, with the touch of a button, you will feel a definite tingling sensation only on the correct point. Use ‘HealthPoint’ to enjoy the powerful benefits of acupuncture… safely, simply, with no needles, no drugs, no side-effects. By electronically locating and then applying minute electronic pulses (micro-currents) to the treatment points, the body’s own healing system is triggered into action – just as with the best acupuncture. What Is The Effect Of HealthPoint? By stimulating the acupuncture points with a special waveform, HealthPoint provides rapid, effective and long-lasting pain relief and, in many cases, an apparent acceleration of tissue repair by stimulating the body’s own healing system. Of all traditional healing methods, acupuncture is the most widely accepted in the West – with 2,000 years of history and significant recent compelling evidence that its theories are wonderfully effective. Stimulation of acupressure is now a common treatment for a variety of painful conditions. Several UK hospitals are using HealthPoint as primary treatment. At the Pilgrim Hospital, Boston, Lincolnshire, HealthPoint is the primary treatment for ME and has been successfully used on over 1,000 patients. Many USA Doctors have used HealthPoint for the past 10 years with great success. Over 160 conditions can be treated using HealthPoint and ‘Simply a Safer Way’, the most clearly illustrated, easiest-to-understand and useful guide to acupuncture treatments. This beautifully illustrated manual – written with Dr Julian Kenyon, M.D., developer of the ‘HealthPoint’ concept & founder of the British Medical Acupuncture Society – is a clearly organised guide to the effective use of acupressure, acupuncture or electro-acupoint stimulation for a wide range of conditions – everything ranging from low back pain to headaches, arthritis to sports injuries, allergies to carpal tunnel syndrome. The safe, simple techniques discussed are designed for home-use – without the need for extensive training – and each of more than 160 conditions includes clear illustrations detailing the exact position of the associated treatment points. As with any medical device, you should always seek the advice of a qualified medical practitioner to ensure a correct diagnosis – BEFORE treating yourself. NB: For the readers’ information, I personally own one of these ‘kits’. I rate it very highly and feel it is an invaluable tool to have to help us deal with and counter many of the health challenges we face today. For those people who are new to the concept and the locating of acupuncture points, seriously, all it takes is a little patience and a little practice. The machine makes this process very easy. The rewards then literally speak for themselves.